Those mouth-watering dinner rolls are something most people remember from holiday meals at home or at grandma’s house. They are so delicious that for many of us, they might as well have been the main course. Even for non-holiday meals, dinner rolls are a staple on tables all around the country and they have a special place reserved in many people’s hearts. Their fluffy, flaky, and buttery taste resonates with most of us and is a dish that isn’t easily forgotten. Even when you remember the work your relatives put into making homemade dinner rolls, making them now doesn’t have to be as intimidating as it seems. There are hundreds upon hundreds of different recipes that are easy to follow and will produce a roll that is delicious and unforgettable. And, they will be nothing like ones you purchase from your local grocery. The sweetness and buttery softness offered from a fresh, homemade dinner roll is one of the most scrumptious and delightful tastes out there. Fluffy and flaky rolls are a must for holiday meals and making them yourself is even better. 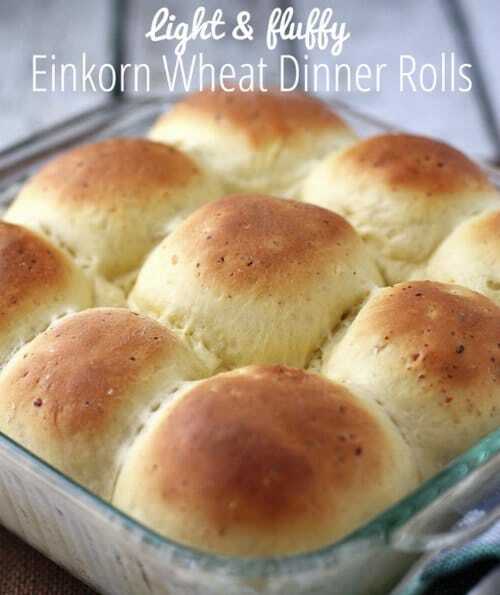 We’ve tracked down an outstanding recipe that will allow you to make your own rolls at home using Einkorn (an ancient form of wheat that contains enzymes that aid in the digestion of gluten, making these rolls a little more tolerable to those with gluten allergies). With this recipe, you will be able to make the tasty rolls with relative ease and without spending all day doing it. A quick trip to your local grocery and you’ll be able to procure all the ingredients and necessary baking equipment you’ll need. It’s a dish that is kind to anyone’s cooking abilities and can be made with little preparation and little baking experience. Dinner rolls are an iconic dinner dish and once you make your own, you’ll see that the older generation had it right all along. The amazing taste and texture you can get out of rolls you bake yourself is an experience you’ll never want to give up.